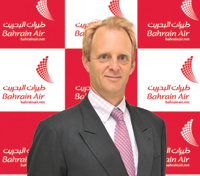 2011 was a challenging year for Bahrain Air as political unrest across the region and on the island meant lower passenger numbers. The year saw passenger numbers drop 25 per cent down on 2010. Looking ahead, Nuttall says that while passenger numbers were slowly returning, yields are still unsustainably low given current high fuel prices. “We are looking at slow recovery and expansion back to 2010 levels. We are revisiting some of the stations we had to leave and if we get the appropriate approvals, will start three to four new routes. But we will not exceed the number of aircraft we had in 2011. This growth will be achieved by better utilisation as the markets recover. We can be more aggressive longer term once we see the market return,” he adds.